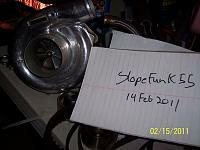 Hello I have a turbonetic ballbearing 60-1 hifi turbo small 63 hotside. I also have walbro 255 gss317 pump for sale. Mods please dont delete I am at work and will post pics tonight. Tial big blue spring I believe that 14 pound spring for 38mm I am not sure what is for other tial wastegates. price for the pump , new or used ?